The Madden NFL franchise has long been synonymous for big plays and big hits on a platform that delivers enough trash talk to make Richard Sherman do a double take. There’s nothing better than a living room celebration after taking one deep on your best friend in the fourth quarter to cap off a 21-point comeback. Madden 17 brings those experiences back into the hands of the player. The upgraded set of gameplay mechanics, improved defensive system, and polished presentation will have you wreaking havoc on anyone willing to test your tight spirals and blitz-heavy defense. Gameplay mechanics across the board have been drastically improved for the better. The most impressive upgrade certainly comes out of the backfield in the ground game. Running the ball has finally been layered with the complexities that are unique to the most demanding position in football. Taking a handoff now requires patience for the play to fully develop while also demanding a certain sense of football intelligence in order to pick the proper gap or select the proper move. Each snap within the running game has become more of a chess play rather than a quick set of motions and achieving success is highly rewarding. Players will notice a button prompt highlighted above a scrum just after the runner and defender make contact. This prompt allows players to battle their way through a pile and break free for extra yardage. Mashing the highlighted button can be the difference between a fourth and out or a first and ten. 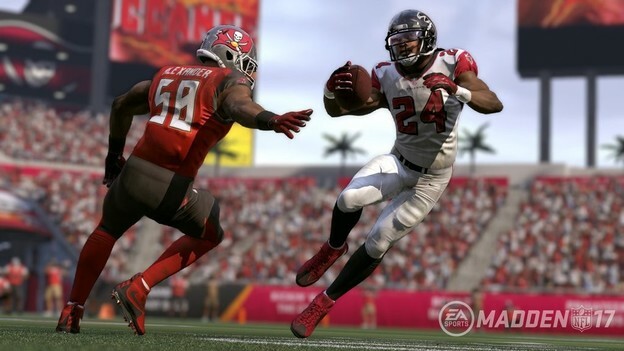 EA Sports has included special moves in Madden 17’s revamped ground game, which provides running backs with a series of moves that directly tie into their running style and overall rating. Finesse backs like Le’Veon Bell and Devonta Freeman have more effective jukes and spin moves while the smashmouth backs like Adrian Peterson and Todd Gurley have more devastating stiff-arms and shoulder plows. The top backs in the league also came equipped with much cooler special move animations than some of the mid-level guys, which is important to note when testing out the new running system. The game has also includes the new Ball-Carrier Feedback System to aid running backs in successful pursuit of the end zone. The system provides players with the ability to identify incoming approaching defenders and recommend moves to elude them. 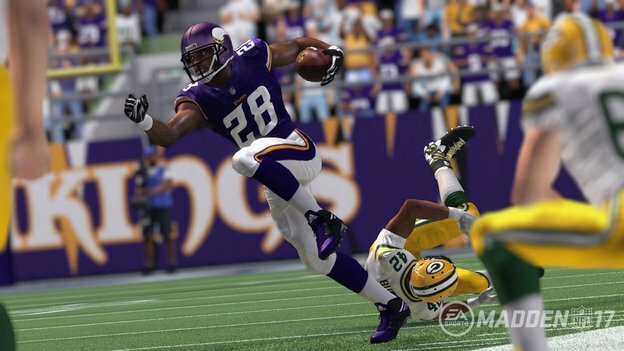 Take charge of Adrian Peterson and hit the right thumb stick for a vintage AP juke just before the defenders approach. The game will populate the button cue on screen at the perfect time for a seamless integration that’s as devastating as it is exciting. Of course, the choice to ignore the recommendations in favor of a different move is always an option, but simply having the ability to pick a Madden-suggested move is a really nice feature. The improved defensive system focuses primarily on two components – the linemen up front with gap assignments and additional zone coverages. 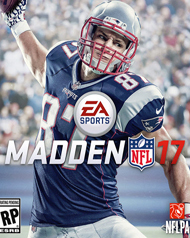 Traditionally, Madden has provided gamers with four separate generic zone coverages. However, this year, gamers have access to an additional nine for a total of thirteen. This provides the perfect platform to not only increase the game’s realism but to also fully customize your defensive schemes. Additionally, those big uglies up front are finally provided with a gap assignment. This leads to drastically improved battles on the line, which results in an entirely new dimension to gameplay. Focusing on the front seven is just as fun as playing in the secondary with the new addition. Doubling up a gap will now result in a higher sac probability as opposed to previous versions where luck was more of a determining factor. Both additions have drastically increased the fun factor of playing defense, especially if you’re a blitz heavy fiend like me.